Roses are red, violets are blue. We are expecting baby #2! The secret is finally out and let me tell you – I am so relieved this is public now! I am almost 14 weeks and the first trimester was filled with exhaustion and 24/7 nausea – typical for most in the early stages of pregnancy. I am starting to feel more like myself lately which is encouraging. Second trimester = honeymoon phase. We actually learned I was pregnant only a week after Abby passed. It was a welcome distraction from our grief but I also don’t know that we fully grieved the loss of Abby because we had to shift our emotions into this new life I am growing. And of course I knew I wanted to incorporate Abby into the official announcement somehow. 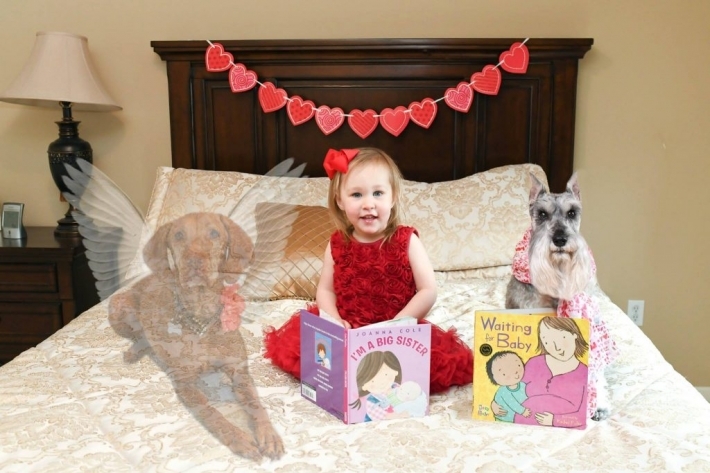 Abby’s translucent image with wings is shown to represent she is still here with us in spirit and forever in our hearts. I can’t wait to share this journey with you. Many of you followed along throughout my last pregnancy, life as a new Mom, and watched all the adorable moments of Remington and Abby interacting with our new baby. Stay tuned for more of the same this time around!